We provide a Lifetime Warranty and Free Mobile Service with our Repairs! 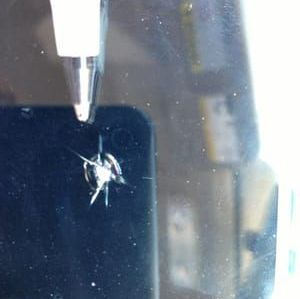 Glass Repair Lifetime Warranty: If the Repair(s) fail we will credit what you paid, towards the replacement cost of your windshield. Service usually takes 20-30 minutes per repair. No wait time or restrictions after repair is complete. With most repairs you can expect up to 90% clarity to be restored. Most insurance companies will waive your comprehensive deductible to have the work done! That means at NO COST TO YOU! If you Choose to pay out of pocket, call now to ask about any of our discounts or special offers! Safety is key! That is why we only use the best polyurethane repair resin on the market to insure the strongest bond and best fill possible, not only to improve the appearance of the break, but also to restore integrity of the glass and save your windshield. Our repair process does not include the use of drills or lighters! These techniques can cause unsafe damage to the laminate layer of the glass even after it has been repaired. Using a lighter can cause separation between the layers of the glass. A drill can put a tear in the laminate of the glass. In either case, it is dangerous for the safety of properties of your windshield to use these during a windshield repair.